It reminded me of school plays when I was at school and so I thought I’d tell you what happened. Every Friday afternoon we were put into groups and allowed to perform plays. My normally reticent personality blossomed at these opportunities and I unashamedly took control. Every so often the plays were honed into performances for parents. I remember the time when our group chose Snow White and naturally I played the leading role as well as organising everyone else. The big day arrived and my mum proudly told the lady next to her that her little girl was starring in the next play. BUT: there were one or two drawbacks. Firstly, I had just started wearing glasses and secondly, I had just lost a front tooth and lastly the teacher helping us get dressed up was rather aesthetically challenged. She had plonked my paper crown over my head till it almost came down to glasses level and had pushed my hair back behind my ears. Of course, I never saw the result as even if she’d had a camera my mother would NOT have taken a picture. My mother said she wanted the floor to swallow her up. Of course I knew nothing of this until years later and was quite happy with the performance at the time. But was it because of this that I had a complete change of heart by the time I went to Grammar school? As a teenager I would have died rather than take part in a school play. However, I enjoyed being behind the scenes and was often trusted to be in charge of the lighting. There was just one episode on the stage when I was in my thirties and pianist for a dancing school. They were using canned music so I was asked to be a fairy in Sleeping Beauty. A piece of ground, a lovely spot. They say as where there’s muck there’s money. And turn into a huge estate. Because, you see, I’m Fairy Land! The producer wanted this delivered with a Yorkshire accent. I wore a white chiffony dress , wellington boots and a floppy hat. My wand was a spade! Strange to say I enjoyed it but wouldn’t do it again! This year I seem to be getting more than my fair share of Galettes des rois. It is officially eaten at Epiphany (around 6th January) but CC and I were invited for coffee at a neighbour’s house the Sunday before last and we were treated to her homemade version of the cake served with champagne before we got round to having the coffee! Yesterday at the library the English classes, always ready for an excuse to party, suggested we had Galette des Rois next week, – naturally accompanied by several bottles of champagne. It was decided who should bring what and I proposed starting the 5 o’clock class at 4.30 so that we could have half an hour to indulge before the 6 0’clock class began. As it happened one of the ladies from the second group had brought a Galette anyway so we ate that during the lesson. Since Christian times the custom has been linked to the visit of the Magi and traditionally the cake is cut into the same number of pieces as there are people . A charm is hidden in the cake and whoever gets it wears the King’s crown and chooses their Queen. If there are children involved the youngest gets under the table and says who should receive each piece. 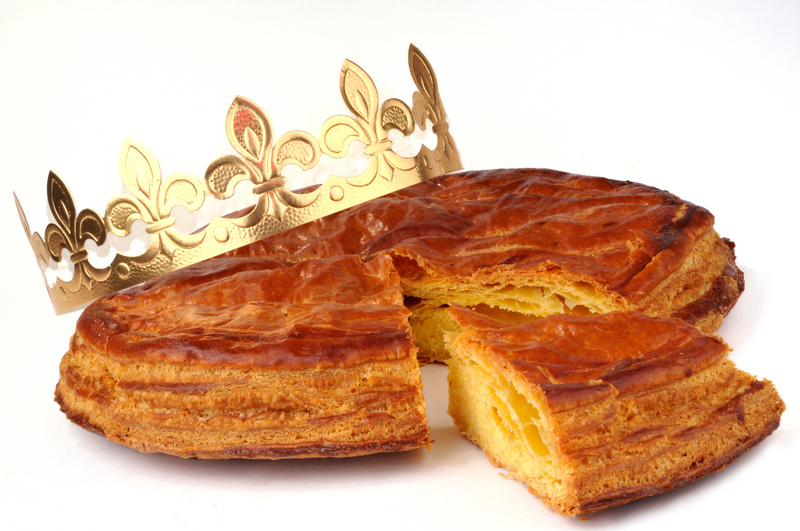 In fact, like many Christian customs, the Galette des Rois has it’s origin in pagan rituals connected to Dionysus and the midwinter festivities. The basic recipe consists of puff pastry with a frangipane filling but there are other varieties made with brioche and alternative fillings including chocolate, coconut, apples etc. So much for starting a diet after Christmas . . . . . . . . . . . .
Kica has developped much more confidence since she came to live with us but she does get anxious when I go away for the whole day on Mondays.Everyone tells me how she has cried, beaten the garage door open and scratched at the front door all day long. Term started today and so I decided to take her with me to teach English in Charleville. Usually Jay drives me into town but he doesn’t like the idea of a dog in his car so I said I’d take the old Citroen and drive in myself. A decision I regretted slightly as it was pouring with rain and darker than ever at 8 this morning. I don’t like driving in these conditions at all! Just as I was about to leave there was a curse from the bedroom. Bear had dropped a glass and a cup of coffee so I had to do a hurried clean-up. He couldn’t help it but it was bad timing. Eventually Kica and I set off and I have to admit I was tooted a couple of times for going rather slowly as I wasn’t too sure where to turn off but we arrived and I parked some way away from the place where we have the classes because I dread having to park ‘en creneau’ (backing in between two parked cars) and will only attempt en epi or en bataille (driving nose in either straight or at an angle). Of course, it was still raining and Kica and I got pretty wet walking to our destination. She was intrigued by her new surroundings but panicked a bit when I left her to go outside to open the shutters. However she soon settled down quietly and didn’t make a sound when my students started to arrive. Most of them accepted her presence willingly but there were two people who made it clear they didn’t like dogs. Kica spent the morning at my feet or under the long table. At home she knows how to ask to go into the garden for a wee but as she was in a strange place I took her out for a little walk after a couple of hours – to no avail. At lunchtime the rain had eased off and I thought we’d better go out before eating so we went for a walk by the river and she duly performed. The path was strewn with dog poo despite the fact that there was a special area nearby. Kica didn’t want to use it though, but I always carry a supply of black plastic bags (provided free by our Mairie) as I think it’s very impolite not to clear up after your dog. We went back and I gave her her lunch but she ignored it and prefered to share my sandwiches. The lunchbreak is two hours so we had time for another walk (also rainfree) before the last two sessions. We finished at 4 o’clock and Kica seemed pleased to go back to the car for the ride home. 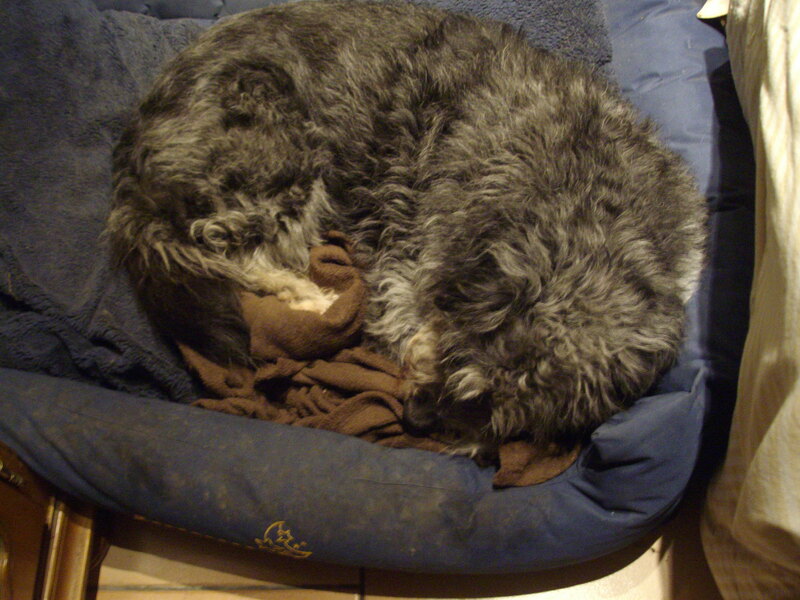 When we arrived she went straight out into the garden, came back and scoffed her food and has been fast asleep in her bed ever since. Anyone would think she had done a day’s work. Sorry,I don’t have a photo of Belinda but she looks a bit like Briony (foreground). It’s Beattie behind her; she’s the only speckled bantam. If you read the previous -post you’ll know that Belinda hatched five chicks and looked after them admirably. The only problem was that she insisted on tearing up the newspaper at the bottom of the cage and filling the drinker with it so I had to keep replenishing the water. When I cleaned them out i set Mother and babies loose in the conservatory and they enjoyed spreading their wings and exploring. At first they all kept close together but they gradually became more independent. When Belinda started laying again and her brood had grown almost as big as she was (they were full sized chickens) I tried reintroducing Belinda to her friends back in the garden but they were cruel to her. Bertie was the worst; he really attacked her and Beattie and Briony joined in. She stuck it out for two days and then I brought her back to be with her babies. A week or so later I tried putting her with the ‘big’ ones but she was traumatised so i brought a poor trembling Belinda back indoors. 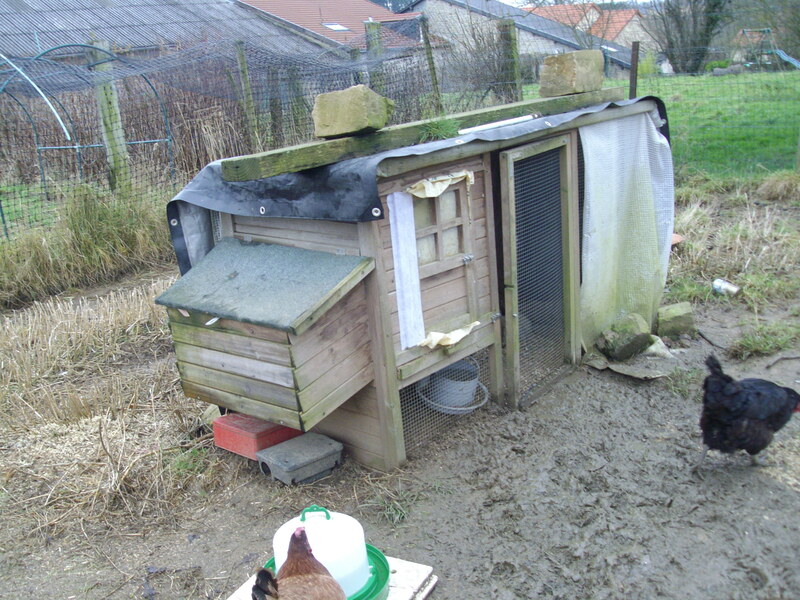 The only soluton seemed to be that the bantams should be persuaded to share the big chicken house with the others. so that Belinda and her family cold have the small house. 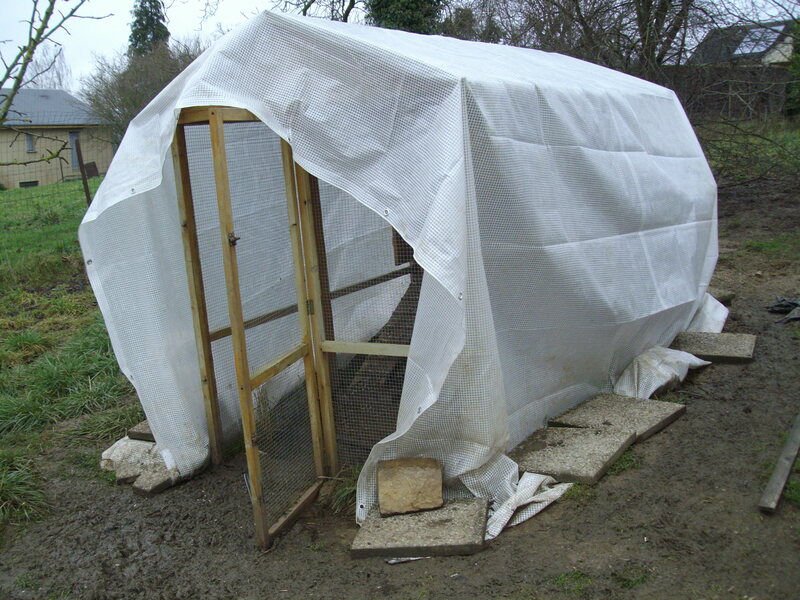 The large house has room for twelve chickens and the run is enclosed with a tarpaulin in an attempt to offer protection from the wind and rain. It has blown off three times already and each time I’ve piled on more slabs so fingers crossed it stays in place during the next gale! There were some nights when i managed to get everyone inside at bedtime and there weren’t too many altercations but sometimes I had to give in and allow Bertie and one or two of the girls to go back their small house. So maybe I should give away the bantams. There was an advert online by a man asking for any birds or animals for a ‘ferme pedagogique’. I rang him on December 23rd and he said he’d come the next day. The 24th dawned with gale force winds and heavy rain. I got soaked going to let the chickens out and feed them and there was no way I was going to hang around trying to keep the bantams shut in one of the henhouses. 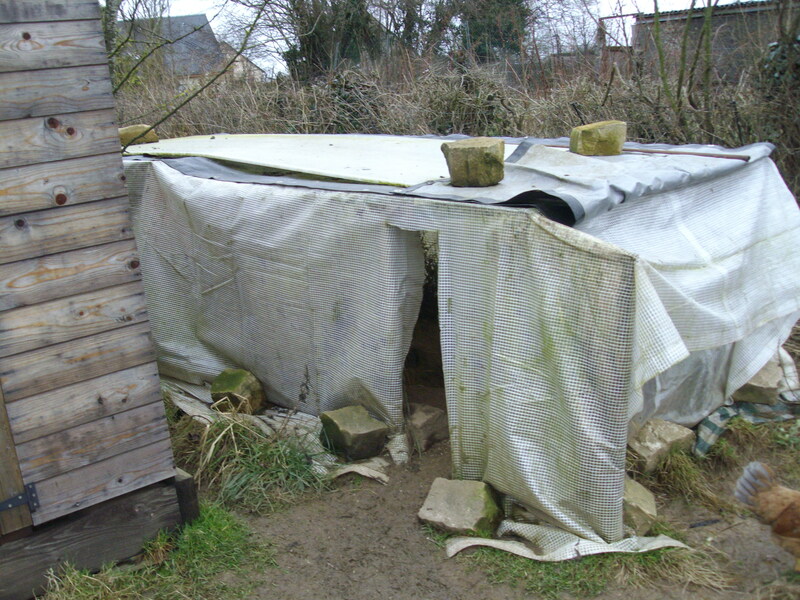 They have this weatherproof shelter where they spent a great deal of time when it’s wet, windy or snowing. Despite the dreadful weather, however, the man phoned and said he was in Charleville (he came from a town about 40 miles away) and asked for directions to our village. It was still raining heavily when he arrived and there was no way we could go and chase chickens when they were all roaming free. If they hid in the shelter I for one, can’t get through the door! So, the only thing I could think of was to let him take Belinda and her chicks. He explained that he had moved to a place with huge barns and lots of land and they would be inroduced to the chickens and ducks he already had – plus a pony and some sheep. He certanly wasn’t planning to eat any of them. I was really sad to see them go but I hope Belinda and he babies will be happy in their new home. I have Neena to thank for this post as she has asked about the chickens. When the blog was going strong a few years ago I wrote about getting Hilda (large white Sussex in the middle of the photo left) and her seven brothers(!!) and bringing them up until I finally had to give the cockerels away (Well actually a friend killed one for me but it was such an awful experience ‘helping’ her that I resolved never to eat our own chickens. Later, when Hilda went broody I bought a dozen fertilized eggs for her to sit on in the same cage she had lived in as a chick. Her chicks grew into five hens and seven cockerels so I had to give six of the boys away. 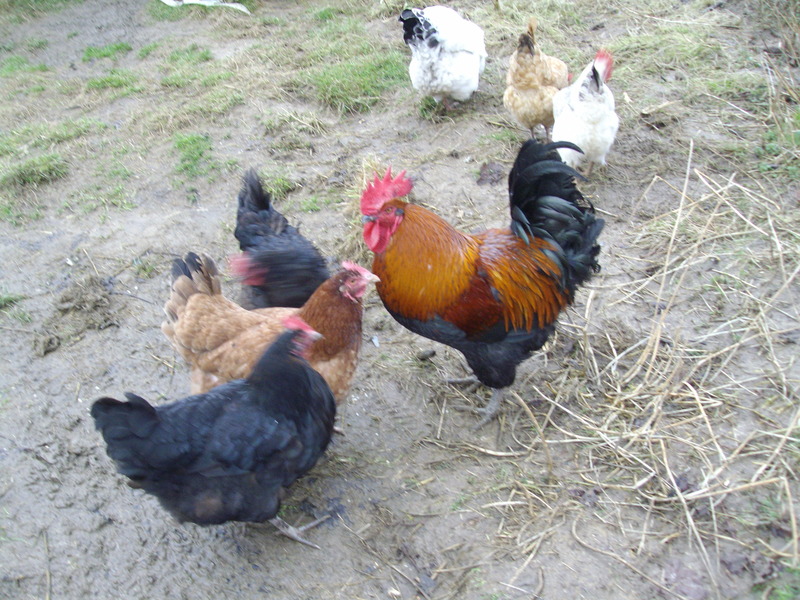 Hector (centre picture ) is now fully grown and in charge of the chicken run. He’s a pure bred Maran as far as I know and has a very pleasant temperament MOST of the time. The hens are called Harriet, Henrietta, Heidi, Beebop and Lulu but I can’t tell the last two, who are all black, apart! They soon learned to get on with Henny-Penny, Hilda and the rest of the original flock who have since died. They either died a natural death, or, as in two cases. became terminally ill and a neighbour had to put them out of their misery. 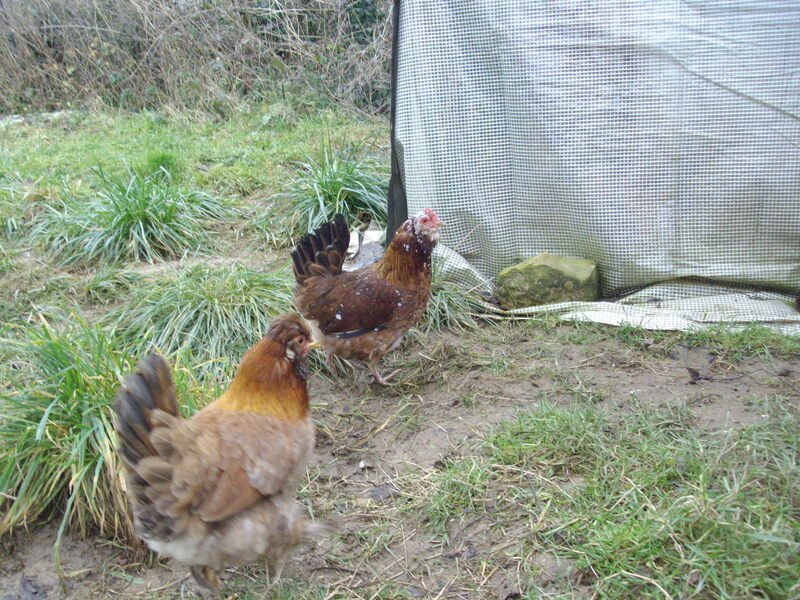 Just behind Hilda is Henny-Penny, the black hen is Hermione (I think) and the brown one is Harriet. Henrietta went broody and sat on five eggs (fathered by Hector) but only one hatched. For a long time I thought she was a boy as she was very feisty and seemed to have large feet but, no it was a hen and I called her Hermione. Henrietta was not a kind mother and soon got fed up with her baby so I searched for some more chicks on the internet and found six two month old bantams which I bought and introduced to six week old Hermione. They got on well together and eventually moved into the small henhouse. 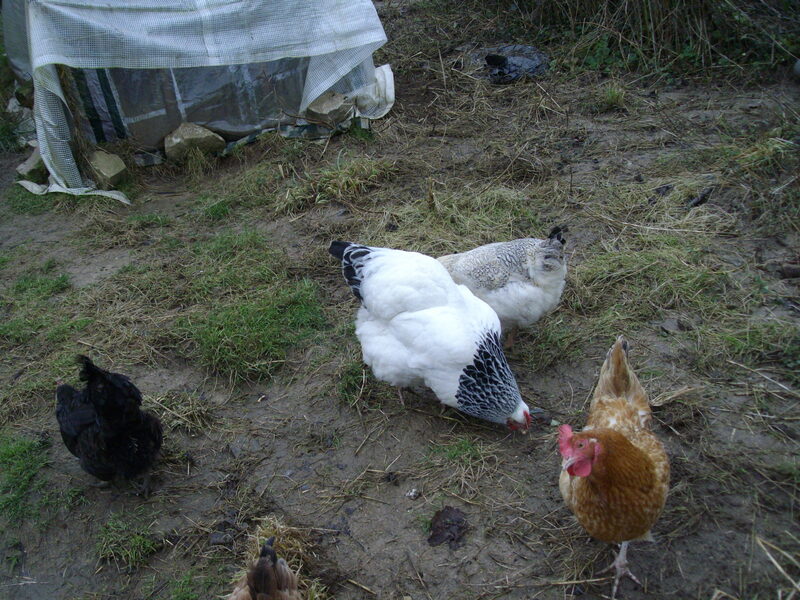 It turned out that one of them was a cockerel (top left) who is called Bertie and he’s a miniature version of Hector. 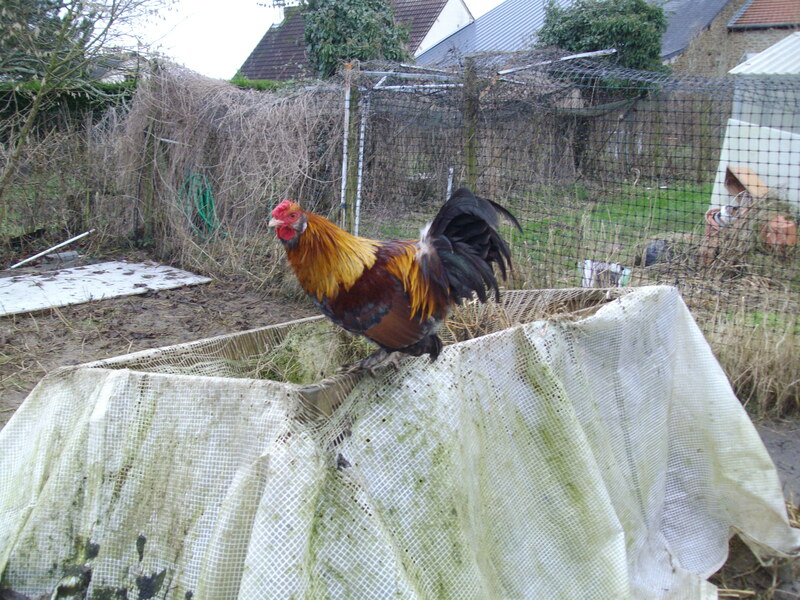 Unfortunately, now that he’s mature , Hector doesn’t like him and so I either have to keep him in the henhouse with run, or let him come over the fence and share the other part of the garden with the cats and dog. He is such a character that I really would like to keep him but it’s not exactly practical. He has also escaped into the neighbour’s garden and I hope I don’t have to disturb her too often to fetch him back. It was some time before I could name the bantams as they all looked much the same when they were young but once they developed their feathers I could tell them apart and so there’s Beatrice (Beattie), Briony, Barbara and Belinda. Sadly, I found one of them dead quite early on before they were named. Belinda was the first to start laying and she decided to go broody in September. I bought some full sized eggs and gave her six to sit one. She came to live in the cage in the conservatory and on October 19th I could hear cheeps from underneath her and five out of the six eggs hatched. Come back to read Belinda’s story next time. This is supposed to be a little medical miracle. According to information on the web it can help to regulate blood sugar and also reduce blood pressure. 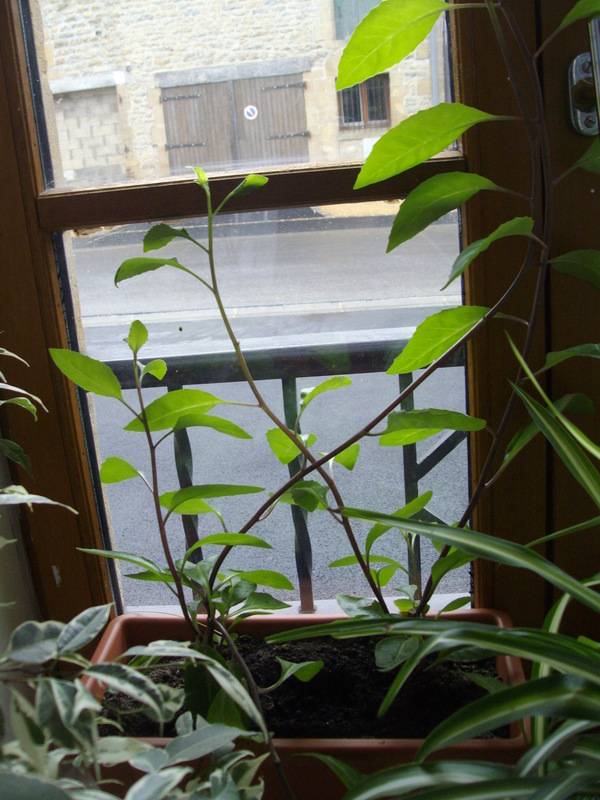 It is quite easy to grow as even in the Winter it has survived on my windowsill which faces south but doesn’t get much sun until the Spring. These are the tops off the two cuttings I bought. The original plants are now ‘branching out’ and growing apace . In warmer climates apparently it grows like a weed as long it has plenty of water and sunshine but it’s not doing badly in its present position. It seems you can’t buy seeds but can only grow it from cuttings. So, what is it like to eat? Well, I nip off a leaf from time to time and it tastes quite pleasant and refreshing with just a hint of ‘hotness’. 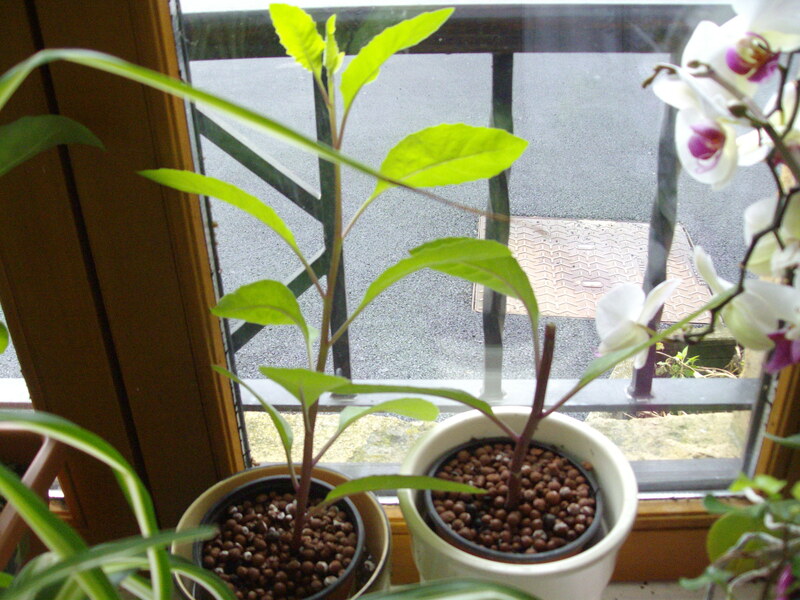 As for reducing bloodpressure, well I don’t know as I think you’d have to eat more leaves on a regular basis and I don’t want to strip my little plants bare until they really have taken off. It’s been a year since I ‘restarted’ and most of the reasons that kept me away from blogging were centred around problems concerning Bear and Whale. 2013 was a terrible year for both of them. Bear’s beloved daughter died of cancer in July and his brother died in October. Bear’s legs have been getting more and more painful – even the left with a replacement knee isn’t very good and at times he feels his legs won’t hold him. He has to use a walking frame. To make matters worse, he was in hospital at the time of his daughter’s funeral so even though Jay had arranged to drive him over to England, he couldn’t go. He was stuck in the Nephrology ward with a serious infection. He asked if he could be taken to sit in the Chapel on the afternoon of the funeral but they wheeled him to a small room on the second floor. Bear was cross and asked me to take him to the ‘real’ chapel but the Aumonier (resident priest) arrived and calmed him down, inviting us to stay for the Wednesday Mass so that he could pray for all the family. It was a very simple but moving service and we were invited to take communion even though I had told him we weren’t Catholics. Bear has suffered from depression ever since losing his daughter and this hasn’t helped the pain which he suffers ‘all over’. We just hope time will start to heal soon. . . . . . . .
Whale has also had a bad year in that he, too, had a serious infection just before Easter and was taken to hospital and put on a drip. A couple of days later he took a turn for the worse and we thought he had had a stroke but, in fact, the antibiotics had caused considerable damage to his kidneys and he was in a bad way. He spent two weeks being fed by tube and aspirated as well for some of the time. He was delirious and, fortunately doesn’t remember much about it. When he was discharged he was much more handicapped than when he went in and now needs a hoist to move him from bed to chair and has to suffer the indignity of wearing ‘nappies’. At first we didn’t know how we would manage, especially as the nurses who used to come in daily declared that they didn’t have time to cope with his more serious disability. Eventually a system of care was put in place and now we have carers who come in twice a day to wash and change him, the nurses come when necessary to deal with bedsores etc. and he has physiotherapy two or three times a week. We also have some financial help towards employing a neighbour (experienced in caring for handicapped people) who comes in some days to assist the carers as they are not permitted to work alone when it involves moving a heavy patient. Jay is designated as his ‘troisieme personne’ and is paid a small sum for all the work he does. CC does her share of helping the carers and between us we manage to lead our own lives to a certain extent despite one or more of us being tied to the bouse all day every day. The youngsters try to keep sane by going to Reims, Paris or Brussels from time to time and CC does four days a month of voluntary work in London. I still teach English and have my chickens, cats and dog to look after so life is quite fulfilling. This year I really will try to write at least once a week. Let’s see how long I can keep it up! Meet Kica (left) who came to live with us in February last year. 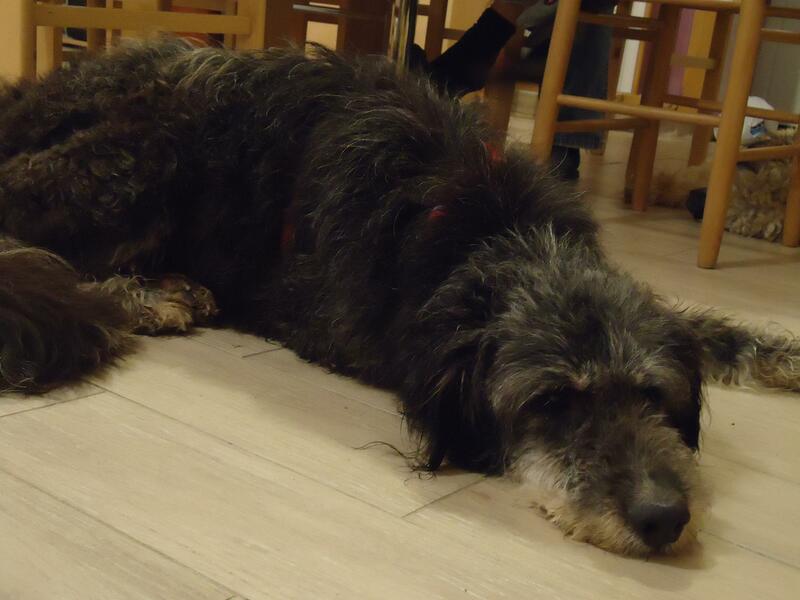 She was rescued from an awful refuge in Serbia where the dogs were half-starved and kept in terrible conditions. She had lived there all her life as she was taken there as a puppy with her mother who died. The Association Mukitza rescues dogs from eastern Europe and Kica was brought to France to stay with a foster family near Reims. She was traumatised and ill from an untreated gum infection. She lost most of her teeth and underwent several operations to try to close the holes in her palate caused by the infection. I found her on the internet and fell in love immediately. She reminded me of the dog my grandparents had when I was small. His name was Jack and he used to guard me and play with me in the garden. The family were not too keen on the idea of adopting a dog but last year we lost two cats, Toby and Pepper, and it left a huge hole in our lives. Another cat couldn’t replace them and anyway, the other cats are too old now to accept a new adult feline while we are too old to take on a kitten. Jay and CC took me to Reims to meet Kica and her foster family last January. She was nervous but adorable. They explained all her problems and were over the moon when I said I was still interested. A trial was arranged so that she could come and meet the cats and see how everyone got along. It took a few weeks but the cats eventually realised that Kica wouldn’t hurt them, despite her size and Kica began to look as though she was at ease with all of us. We were supposed to take her back before she had another operation but illness in the foster family meant that we kept her and took her to the veterinary hospital ourselves. The people from the Association came to inspect us while Kica was with us and we met with their approval. Despite the fact that the operation wasn’t successful they allowed me to adopt her. She has been with us for nearly a year now and has the confidence to give a warning bark when anyone comes to the door. She has put on weight (perhaps a bit too much!) and so a New Year Resolution for both if us is to walk more! !